This week I sat down with Roger and Gil to talk about the program. 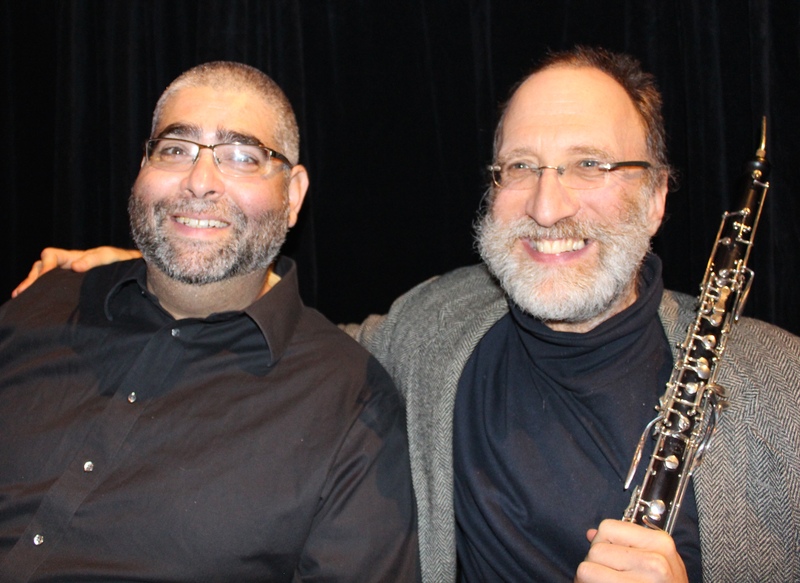 Roger Wiesmeyer (English horn) and Gil Perel (bassoon) have played together as members of the Nashville Symphony’s wind section for more than a dozen years: Roger joined the orchestra in 2001 and Gil in 2003. I asked Gil if he’d ever performed it before. “Other than as an audition, I’ve never performed it. I’ve been playing it for 23 years! And I’ve never performed it.” he said. “That is why the Nashville Concerto Orchestra is here!” said Roger. “The last movement is just a minuet. Roger and I were talking about it, and we think it seems like he was in a rush to finish it. He just….did it. You can tell, when it’s over, it’s just like: five, one! It’s over! 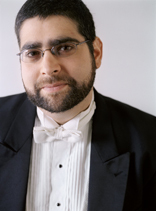 “It’s one of those pieces – as early as it is in Mozart – it’s perfect for the bassoon. It sits in the register beautifully, it’s easy to project the right way for that piece, it fits on the instrument well, even though the instrument is quite different now that it was in the 1770s. 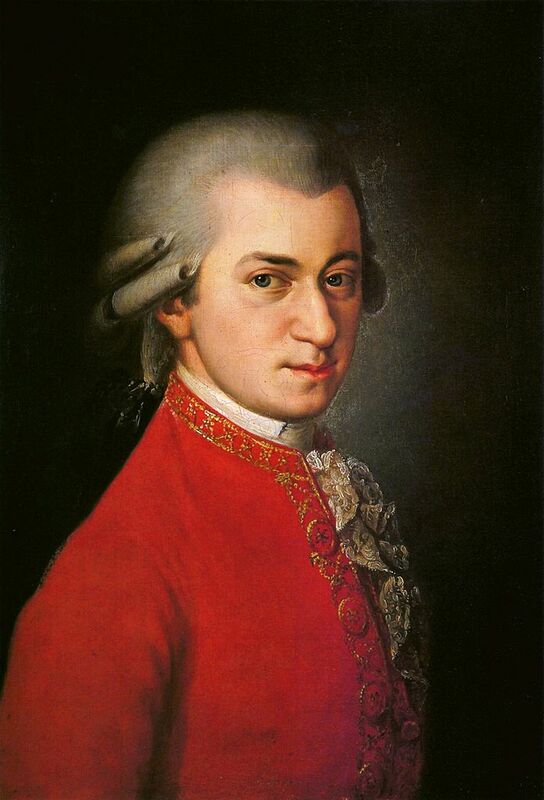 Gil enthuses about Mozart nearly as effusively as Roger does, and he has long been a participant in Mozart in Nashville concerts. When the Nashville Concerto Orchestra was launched last year, Gil performed a Vivaldi Bassoon Concerto on the first program. I asked Roger about the B flat piano sonata, which he is performing on the program. “People say that this sonata is written on such a grand scale that he’s anticipating the piano concertos he was going to write later.” he said. “In fact, he throws a cadenza into the middle of the last movement! which normally we would only have in a concerto. 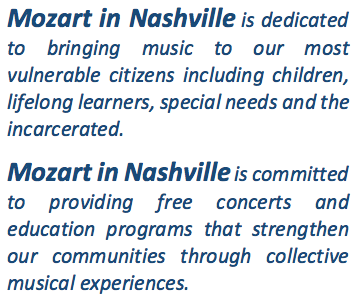 Mozart in Nashville is a nonprofit, 501(c)(3) organization dedicated to bringing classical music to those who might not otherwise encounter it. The organization’s activities include the annual Mozart Birthday Concerts; quarterly performances of the Nashville Concerto Orchestra; and small ensemble and solo performances throughout the community, all year round. For more information click here to visit the Mozart in Nashville website. 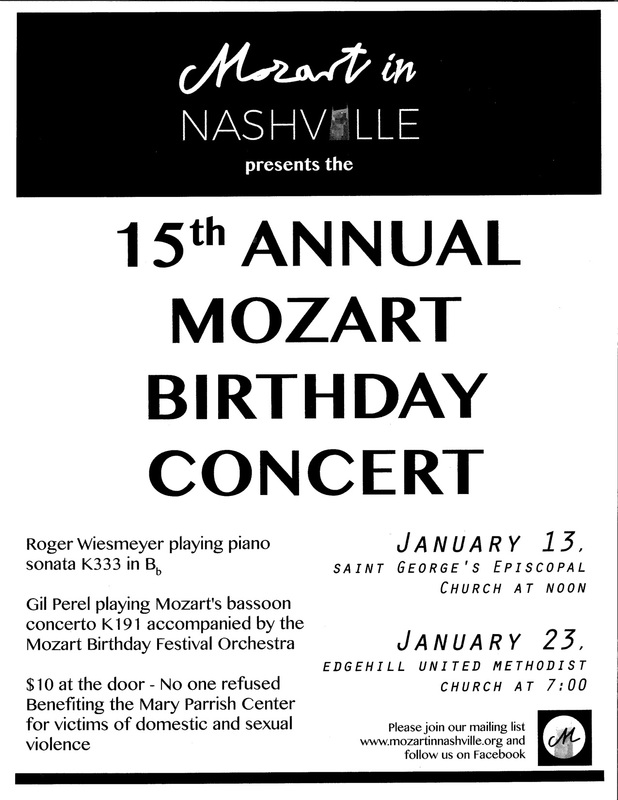 Proceeds from each Mozart Birthday concert will be split between the venue (the church where the concert takes place) and the Mary Parrish Center in East Nashville. The suggested donation is $10 – no one will be turned away. 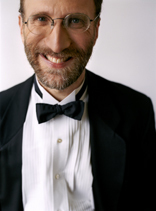 By walterbitner in Chamber Music, Community, Mozart in Nashville & Concerto Orchestra, Music on January 6, 2017 . I have never considered an all-composer concert for their birthday. To throw in the activism of making it a fundraiser is even better. Do you think another composer would work? Or even a modern legend like Michael Jackson or the Beatles? I did a Beethoven’s Birthday concert once with some friends when I was in my twenties. I think there are a lot of composers for whom it would work!